Becky James believes she has time to recover her form in time for the Olympics in Rio next year. The 23-year-old won gold in the keirin and sprint at the 2013 Track World Championships. She made her comeback after 18 months out with injury at the Revolution Series in Derby at the weekend. "In 2012 when I had my appendicitis it was just a year before I won my two world titles," said the sprint specialist. "In February  I was in bed having my appendix taken out and it took me a good four or five months to get fit. "After that I had eight months solid of consistent training and I became double world champion, so I've got a year to make that right now looking towards Rio." The British cycling team for Rio will be selected in mid-June 2016 with performances during the period running from 1 October 2015 to 1 June 2016 taken into consideration. 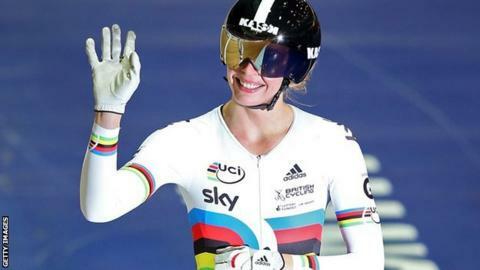 After her comeback in Derby, James is looking forward to competing in the World Cup series through the winter. However, after shoulder and knee injuries left her on the sideline for a year and a half, James admitted feeling some apprehension ahead of her return. "There were times when I thought I was never going to get back," she said. "It's a long time to be out and I just couldn't imagine myself racing again. "When I was watching the worlds this year it was strange because I couldn't imagine myself actually being on the track. "But once I got back to that normal training regime I got over that fear of racing again and got more excited than anything. "Once I got over that then the last few weeks I've just been really excited to start racing again." James, from Abergavenny, won silver and bronze for Wales at the Commonwealth Games in 2010. She missed the London Olympics after her appendix surgery, but was the British success story of the 2013 World Championships, picking up bronze medals in the team sprint and 500m time trial in addition to her two gold medals in Minsk. Since then her career has been curtailed by injury. James was expected to star at the Commonwealth Games in Glasgow 12 months ago but had to pull out because of a recurring knee problem. She then needed surgery on a long-standing shoulder problem.